This healthy vegetarian meal-in-a-bowl is made with lots of fresh vegetables to keep you on track for your 5-a-day target. Packed full of goodness, it tastes so good topped with grated Pilgrims Choice Cheddar melting into the hot soup. Scrumptious! 1. Heat the oil in a large saucepan and add the onion, cooking it gently for 2-3 minutes until softened. 2. Add all the remaining vegetables, then tip in the can of tomatoes and pour in the stock. Add the oregano and parsley. Bring to the boil, then reduce the heat and simmer, partially covered, for 20-25 minutes or until the vegetables are tender. 3. Check the seasoning, adding salt and pepper to taste. 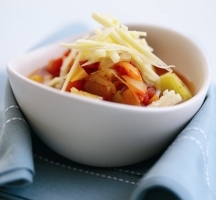 Ladle into warm bowls, then serve, topped with the grated Pilgrims Choice Cheddar Cheese. Cook’s tip: Use your choice of vegetables according to the season: try parsnips instead of swede or substitute green beans for the leek.